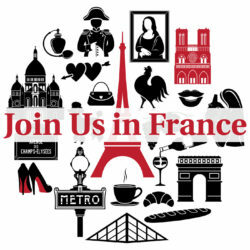 The WW1 Centennial is coming up and I wanted to mark the occasion by telling you about a few of the places you might want to visit in France if you’re interested in WW1 History. And even if you don’t want to make WW1 the theme of your trip, these are places that are worth a visit if you’re near Lille, Amiens, Arras, Verdun, the North of France and Alsace in general. 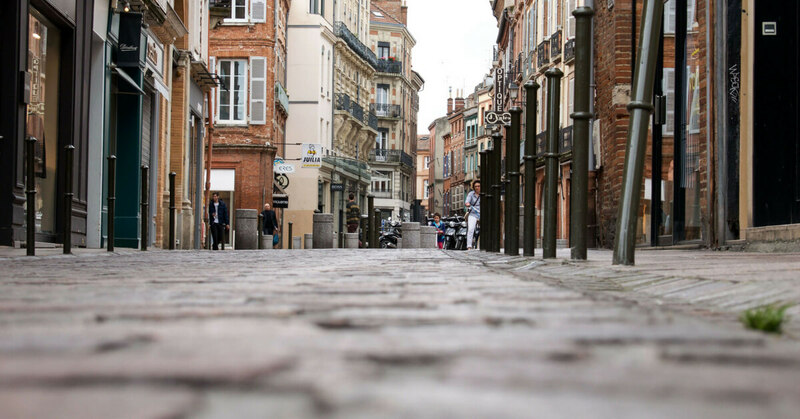 We haven’t talked about most of these places yet on the show, they are not the most “touristy” places in France, which doesn’t mean they’re not interesting if you’re in the mood for something off the beaten track in France. We’ll mostly talk about sites that are in the Somme area, in the Hauts-de-France region. Straight drive north from Paris. But also one near Verdun, which is not at all in the same area, that’s in Alsace. The theme of this episode is important WW1 memorial sites in France that are of interest to English speakers. I picked some of them because they are huge and really famous and others because I found them touching and I would like to see them myself. I will not try to mention all of them, this is by no means exhaustive. Just my selection done on this particular day, we may have other episodes that mention other places in the future. These are memorials dedicated to British, Australian and American soldiers, plus all the Commonwealth countries that sent troops. There are, of course, lots of memorials to French soldiers as well, they’re outside of the scope of what I decided to talk about today, but you will see many of them as you drive around France. As a matter of fact, every French town and village has a memorial to WW1 and WW2. When I was doing some research on this, I realized that there aren’t a lot of people searching for WW1 and I thought maybe I shouldn’t even do an episode about it, but you know what? WW1 changed France forever, you can’t really understand this country if you ignore this topic completely. The other reason why I hesitated to do this episode is because this is so complicated to put together. There are thousands of sites and I haven’t visited most of them yet! But, if it’s complicated, that alone is a good reason to help you sorting this out? And I’m not ready to forget. Every person you meet in France has grandfathers or great grandfathers who served in WW1. They called everybody to fight in this war. 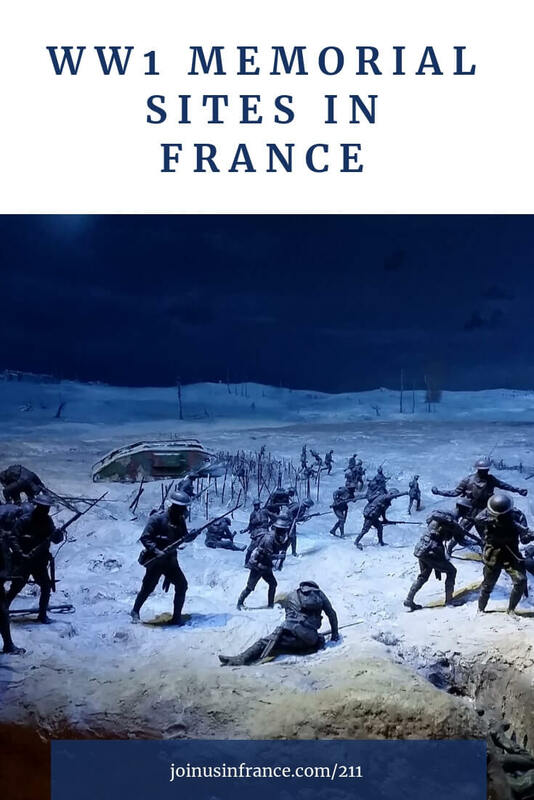 Almost every French soldier had to go serve in Verdun because the conditions there were so awful, they rotated soldiers in and out to reduce the number of suicides. WW1 is in France’s DNA even though it ended 100 years ago. One is free and it’s called Immersion 14-18, you walk outside the dome with a free App you install on your phone and as you walk around the map it tells you about things that happened in specific places. That’s going until Jan 20th 2019. The second costs 12€ and it’s indoors, it’s a small exhibit that says a lot. Museum curators borrowed important artefacts from 25 countries what were involved in WW1. It’s called “A l’est la guerre sans fin” because while WW1 ended on Nov 11, 1918, it kept going in many other countries. In Hungary, the treaty they signed at the end of the war is still a political hot potato. Hungary lost 2/3 of its territory in those treaties. That particular exhibit has a lot to do with the Eastern Front of WW1. The Marne is a river. It’s 500 km long and it looks like an arc that goes roughly between the southern part of Alsace to Paris where it meets up with the Seine river. There were battles all along the river because the Germans wanted to capture Paris. Mostly French casualties, so we won’t talk about that today. The Somme is also a river. It’s half the length at around 250 km and it flows east to west north of Paris. It starts east of Amiens and goes all the way to the English Channel. We’ll mostly talk about that area. And the third major area of WW1 battlefield in France is in Verdun. It is a city a little bit west of Metz and not far from the Franco-German border. We talked about it on Episode 205, and it’ll come up again today. So, here are the SEVEN memorial places I think are worth a visit for English speakers who are visiting France and want to learn about WW1. Pozieres: If you’re driving north from Paris, you’ll get to Pozieres in about 2 hours. It’s also about 40 minutes’ drive north east of Amiens. This is mostly a British Cemetery which commemorates over 14,000 British casualties. There are some South Africans, Irish, and Australians buried there too, as well as many other Commonwealth nationalities and unknown soldiers. This is a cemetery with white stone and peaceful green grass, you can walk between the rows of graves and see how young most of these men were. But it’s right off a major road and there’s a great parking lot so all the tour buses stop there, it can get busy at times. It’s a must-stop for people visiting WW1 sites in France. This is a cemetery and memorial, no museum. But well-worth a stop. You can see the Viller-Bretonneux Australian National Memorial, it’s a beautiful white stone memorial and cemetery dedicated to the unidentified Australian soldiers. Monash Center is nearby, it is a recent museum that shows multi-media presentations (bring your smart phone and some earbuds if you have them, they’ll also rent you some there). Really informative, really easy to understand what happened because of how they present it. I’d definitely stop there! The Franco-Australien Museum nearby (spelled in French) is closer to the town of Viller-Brettonneux. It is housed in a former school building that’s been renovated. It’s pretty small, but still worth a visit. It displays lots of memorabilia, prints, moving accounts of personal items, that sort of thing. It is a French museum, so it assumes you know a lot and just want to see the artefacts. I’m sure that’s true for some of you, but maybe not everyone. The only All-Australian cemetery in France. Fromelles is 2.5 hours north of Paris near Lille and is part of the Battle of the Somme. This is the place where Australians entered into the fighting for WW1 and almost 6000 of them were slaughtered in that one battle. Many of these soldiers used to be in a mass grave, have now been identified by DNA and the Australian families know at last for sure what happened to them. They are now entered at the Pheasant Wood Cemetery which was completed in 2010. The memorial is done tastefully, provides an informative booklet (if you read it, that is!) and a museum where you’ll learn about the Anzacs and the battles that took place in this area. This is a must-see, especially for Australians. Musée Jean & Denise Letaille : This is a private collection from someone who is passionate about keeping the memory of Commonwealth soldiers who gave their lives in France. It’s a small museum, but it has a great audio guide and it is inspiring. It is staffed by volunteers, they have limited hours, check their website for most current hours. Not too far from the museum is the Bullecourt Digger, a statue set in a beautiful field where horrible battles took place 100 years ago. The sculptor is Australian Peter Colett and features the face of his father who fought at Bullecourt. Like many of these memorials, it’s not super showy, but it stands for a lot of suffering and respect. In that same vein and also in Bullecourt you have the Slouch Hat Memorial. This whole area had been taken, lost and retaken 19 times. By the end there was nothing left. And yet, the village is back, along with poignant memorials to the memories of the 10,000 mostly Australians who gave their lives there. When you’re in Bullecourt, you’re pretty close to Arras, which has the Wellington Tunnels. Thiepval is also nearby, but I won’t go into those because we did on episode 205, but also definitely worth a visit. Now what about American WW1 Memorials? There aren’t as many because Americans didn’t send as many troops. But there is one called the Somme American Cemetery in Bony, in the Somme Battle. This one is near Amiens. It’s not huge, but it looks like a wonderful memorial place. And the last thing I’m going to mention today is the Montfaucon American Monument. That one is near Verdun, so not at all in the same area. But if you’re visiting the Verdum Memorial, you might want to stop there as well. One more thing I want to mention before I close is the Spanish flu. WW1 killed millions, but the Spanish flu probably killed more. Probably between 50 and 100 million. The Spanish flu started in the Spring of 1918 just as the war was ending and went on until the fall of 1819. Talk about the double whammy! This 1918 flu strain was particularly nasty because it killed mostly people between 15 and 35 and pregnant women. So if you had survived the war, maybe the flu would get you. Women who didn’t fight in battle but got pregnant as soon as their soldier husbands got home died in droves. There were French villages where during the second half of October 1918 half of the women between 15 and 35 died, within the span on 2 weeks! So here we are in 2018, thinking about a war that ended 100 years ago. We have no World War in progress, no virulent flu strain this year. We are very lucky. So, there you have it, just a few places for you to visit to commemorate WW1 and pay respects to the soldiers from your country who fought and died in France. There are some spectacular memorials in Belgium too BTW. When you visit the north east corner of France, you’ll run into a lot of memorials and monuments and small museums. WW1 is just as omnipresent in the north-east of France as WW2 memorials are in Normandy. I think it’s wonderful that so many people who’ve done trip reports with me talked about visiting war memorial sites with their kids. If you want your kids to understand history and have it be more than some boring subject, it’s great to take them to WW1 and WW2 sites if you get the opportunity.